Vittorio Mezzogiorno was an Italian actor. Mezzogiorno was born in Cercola, the youngest of seven children and his older brother Vincenzo, who wanted to become a director, introduced him to the theatre. At 18, Mezzogiorno enrolled at the university and began medical studies before choosing law, he had his first experience as an actor at the Teatro S. theatre where he recited texts by Samuel Beckett and Eugène Ionesco. Desiring to improve his diction he spent long nights exercising his voice with extracts of the Penal Code, in 1962, at age 21, he played Estragon in Waiting for Godot at the Piccolo Teatro of Naples. In 1966–1967, he joined the troupe of Eduardo De Filippo, in 1969, he met actress Cecilia Sacchi. Their collaboration quickly turned to a relationship and they were married on 14 October 1972. On 9 November 1974, their only child Giovanna Mezzogiorno, who became an actress, was born. The family settled in Rome where Mezzogiorno fully dedicated himself to the theatre, more than ten hours of entertainment, a year of rehearsals, six months of training in martial arts, the challenge of Peter Brooks Mahabharata, transcription of the long epic of Hindu mythology. Roberto Remigio Benigni, Cavaliere di Gran Croce OMRI is an Italian actor, comedian and director. He co-wrote and acted in the 1997 film Life Is Beautiful, which garnered him the Academy Award for Best Actor and the Academy Award for Best Foreign Language Film. He portrayed Inspector Clouseaus son in Son of the Pink Panther and has collaborated with filmmaker Jim Jarmusch in three of his films, Down by Law, Night on Earth and Coffee and Cigarettes. Benigni was born in Manciano La Misericordia, the son of Isolina Papini, a maker, and Luigi Benigni, a bricklayer, carpenter. He was raised Catholic and served as a boy, he still considers himself a believer. His first experiences as an actor took place in 1971. During that autumn he moved to Rome where he took part in experimental theatre shows. In 1975, Benigni had his first theatrical success with Cioni Mario di Gaspare fu Giulia, written by Giuseppe Bertolucci. Benigni became famous in Italy in the 1970s for a series called Onda Libera, on RAI2, produced by Renzo Arbore. A great scandal for the time, the series was suspended due to censorship and his first film was 1977s Berlinguer, I Love You, by Bertolucci. His popularity increased with Laltra domenica, another TV show of Arbores in which Benigni portrayed a film critic who never watches the films hes asked to review. Bernardo Bertolucci cast him in a speechless role as a window upholsterer in the film La Luna which had limited American distribution due to its subject matter. In 1980 he met Cesenate actress Nicoletta Braschi, who was to become his wife and it was an unprecedented act, given that until that moment Italian politicians were proverbially serious and formal. Benigni was censored again in the 1980s for calling Pope John Paul II something impolite during an important live TV show, Benignis first film as director was Tu mi turbi in 1983. This film was his first collaboration with Braschi, in 1984, he played in Non ci resta che piangere with comic actor Massimo Troisi. The story was a fable in which the protagonists are suddenly back in time to the 15th century. Stefano Lelio Beniamino Accorsi is an Italian actor. He graduated from Bolognas Theatrical School in 1993, and acted in the theatre for several years before moving to cinema, in 1995 he played the lead in Jack Frusciante è uscito dal gruppo, one of his best known films. In 1998 he worked with Daniele Luchetti in I Piccoli Maestri, in the same year he won three prizes for his role in Radiofreccia, directed by rock star Luciano Ligabue, including David di Donatello for Best Actor. He was the lead in the successful film Lultimo bacio and he won the leading role in Maria de Medeiros’ Capitães de Abril, and has worked with director Nanni Moretti in The Sons Room. In 2001, Accorsi had the role in Ferzan Özpeteks Le fate ignoranti. This film was a big success in Italy and in Turkey, and Accorsi and he starred in David Blairs Tabloid TV and in Marco Pontis Santa Maradona. Then Accorsi acted in the TV film Il giovane Casanova by Giacomo Battiato and he didnt make any more films for about a year, during which time he went to France. Michele Placido is an Italian actor and director. He is best known for the role of Corrado Cattani in the TV series La Piovra, Placido was born at Ascoli Satriano, into a poor family from Rionero in Vulture, Basilicata, he is a descendant of the known brigand Carmine Crocco. Placido had a number of jobs since his youth and he studied acting at the Centro Sperimentale di Cinematografia in Rome, and with Silvio DAmico at the Academy of Dramatic Arts. He made his debut as an actor in the play Midsummers Night Dream in 1969 and his first success came with the role of soldier Paolo Passeri in Marcia trionfale, for which he won a David di Donatello. Two years he won the Silver Bear for Best Actor award at the 29th Berlin International Film Festival for his role of the worker in ironical melodrama Ernesto. He went on to play the part in the subsequent three series, until his characters assassination. In 2008, in a reversal of roles, he portrayed longtime Mafia boss Bernardo Provenzano in the TV movie Lultimo padrino, a recognizable role to US audiences is that of an Italian businessman in the 1988 comedy Big Business. Amedeo Nazzari was an Italian actor. Nazzari was one of the figures of Italian classic cinema. Although he emerged as a star during the Fascist era, Nazzaris popularity continued well into the post-war years, although Salvatore Amedeo eventually moved to Rome, he always retained a slight trace of his native Sardinian accent. While Nazzari was keen on gaining film contracts much of his experience was in the theatre. He entered a contest organised by Twentieth Century Fox to find an Italian actor to fill the boots of the recently deceased screen star Rudolph Valentino, but lost out to Alberto Rabagliati. 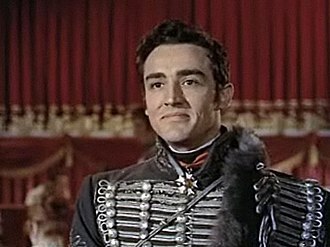 He was rejected after screen tests by Italian professionals, who found him too tall, Nazzari made his debut in Ginevra degli Almieri, following a recommendation from Elsa Merlini. 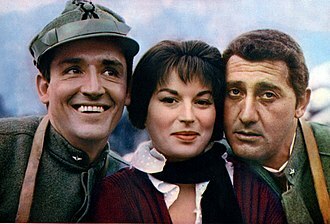 His first read role came with the 1936 film Cavalry, and his breakthrough came with the 1938 film Luciano Serra, Pilot where he played a First World War veteran who returns to fight for Italy during the Abyssinian War. 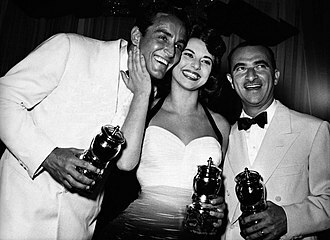 Nazzari was transformed into an idol, the most bankable star of Italian cinema. Following the film, Nazzari was invited to join the Fascist Party by Benito Mussolini, I would prefer not to concern myself with politics, occupied as I am with more pressing artistic commitments. Despite declining to join the party Nazzari, along with a handful of other such as Fosco Giachetti, was considered the model of a Male Hero. Most of his roles from this point present him as a masculine figure. His emergence as a star coincided with a drive by the Italian government to rebuild the countrys film industry which had declined since its heyday in the silent era. This policy involved large-scale government funding of films and the construction of the massive Cinecittà studio complex in Rome, the number of films produced each year climbed rapidly, with Nazarri a particularly prolific actor. Nazzari was almost always cast as a hero, and he closely protected his public persona to avoid any negative roles. An exception was the historical comedy-drama film The Jesters Supper in which he plays a loutish figure, Nazzari made four films with Alida Valli, including Unjustified Absence.